This course may not be taken before a student has completed at least four (4) paralegal courses at NPC without prior consent from the education director. Such permission will be granted only upon a showing that the student has a significant educational or employment background in legal writing. This course is an advanced course that seeks to refine the student's ability to write in a formal, legal manner. In addition, students will receive training in drafting legal memoranda and briefs. The course will look at the different types of legal memoranda and writings that exist. It will differentiate between the forms of legal writing and train the students in the art of adapting one's writing to the given situation. The student's familiarity with legal research through Lexis or other means and basic knowledge of the United States court system and the differences between mandatory and persuasive authority are presumed. 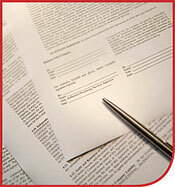 The course will focus on developing the ability to apply legal research to the creation of the written legal document. Students will be asked to research, draft and submit an appellate brief based on an assigned fact pattern and fictitious procedural history. Appropriately differentiate between the various types of legal writing, including the intra-office memorandum, the legal brief, etc.